From short to extended stays, CEDARCREST Animal Clinic offers top-rated, modern and luxury boarding for dogs of any age! Dog boarding in Fishersville, VA – Our premium boarding facility, constructed in 2000 as an extension to our veterinary clinic, offers a modern and luxurious dog boarding experience in Fishersville, VA and serving clients from Waynesboro, Staunton, Charlottesville, to Harrisonburg! 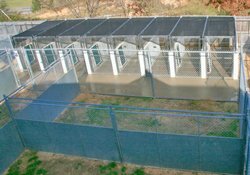 From comfortable, climate-controlled kennels to acres of outdoor landscapes, we provide accommodations for dogs of all ages, breeds, and sizes. We also offer a variety of one-on-one and interactive activities and believe the boarding experience should be like a vacation for your pet! Guest comfort, health, and happiness are our top priorities and our entire staff will do all they can to ensure each guest has an enjoyable stay! – Canine Influenza (CIV) (Both H3N8 and H3N2)For your pet’s added protection, we also recommend the Bordetella vaccination for protection against Kennel Cough. In order to maintain our flea and tick-free status, all pets must be free of external parasites. If parasites are detected during the pre-entry exam, they will be treated prior to entering the Country Club, and the fee applied accordingly. Use of our outdoor play yards is limited to guests that are currently taking a heartworm preventative. All guests are expected to behave in a manner that reflects respect to other pet guests (no aggressive behavior). In the event of changed plans, a 24-hr notice of cancellation is required to avoid a one night’s accommodation fee. Owners with pets staying in select Special Suites can log on during their pet’s say to check in and see how they are doing while on vacation! For more information on our Suites, see our accommodations below. Contact us or to schedule a stay for your dog or to schedule a guided tour! 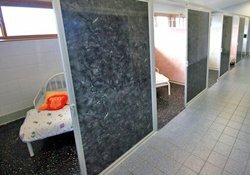 Luxurious, climate controlled spaces with heated floors, cozy bedding, private camera feeds, and lots of love and attention! We offer premium luxury boarding and quality care for all of our guests. Each guest’s stay is tailored to their needs whether they want a fun-filled adventure or a quiet, relaxing vacation. We pride ourselves not only on the level of cleanliness of our facility but also on the amount of individual care and attention we are able to offer to our guests. We provide cozy bedding, twice-daily feeding, plus lots of love and attention to all of our guests. Each guest also has the option to use our outdoor play area in good weather and is escorted on two daily individual walks around the grounds. Our Deluxe rooms contain individual indoor, Formica runs in an array of elegant, cheerful, and soothing colors. Each room also has large bay doors that open for fresh air and a great view! Notice: Non-neutered male canines receive the Basic Deluxe Suite accommodations unless otherwise approved by our team. Please contact us if you have questions about availability and Suite options. For guests who like to indulge while on vacation, we have private, individual rooms in this special area. Guests stay in their own large, comfy suites (7½’ x 6½’) decorated in rich, luxurious colors, with skylights, beds, and other special furnishings. These pampered pets are brushed each morning and enjoy a bedtime Quiet Care Session (includes belly rubs, a bedtime snack, tuck-in service and a goodnight hug!). As an added bonus, we have suites available with private webcams so you can check in on your pet throughout their stay! Young pups are not allowed in this room, which contains large individual suites for senior guests only (7 years and older). The Seniors Lodge is located away from the excitement of the other guest areas so our seniors can enjoy a quiet, relaxing, stress-free environment. Each suite is furnished with cushioned orthopedic beds and every guest in the Seniors Lodge receives unlimited walks and our senior meal plan. We offer a variety of additional activities and pampering services for your dog to make them more comfortable during their stay. We offer bundled service packages and a-la-carte add-ons to individualize your pet’s stay! No matter which services your pet participates in, they are sure to have a great time! Choose from the following options to add individual add-ons to your dog’s stay or see our Packages below for bundled savings. Give your pampered pooch some extra special attention with a daily brushing. This relaxing service is a great way to start your pet’s day while also keeping them well groomed throughout their stay. If your pet is shedding, we can also perform a daily brushing with a Furminator. A daily Extra Walk is a great way to exercise and have fun! Extra Walks benefit guests who like to explore, spend time outside or maybe just need that extra potty break. Guests can sign up for one or two Extra Walks per day. Everybody knows pets love getting dirty but getting them clean is not always so easy. We can help! We have everyday shampoos for a typical bath that will leave your pet squeaky clean and smelling good, oatmeal shampoo for sensitive skin, herbal shampoo for a relaxing bath, medicated shampoos to take care of flea and tick problems or skin issues and even de-odorizing shampoo for when “making friends with the skunk” didn’t go as well as expected. We even have an elevated bath tub to help us give your pet a thorough clean even in the hard to reach places. The best way to end a fun-filled day at the Country Club is with a soothing Quiet Care session. The Quiet Care is a time to wind down, relax and get ready for bed. Our Care Providers will spend time helping your pet to snuggle down with belly rubs, head scratches and lots of hugs! Of course, no tuck-in is complete without a bedtime snack so each guest will also get a special treat as part of their Quiet Care session. A Yappy Hour is time set aside during the day for activities that our guests would normally do at home with their families. We know that boarding can sometimes be a stressful experience, so we want to do whatever we can to make each guest’s stay enjoyable. Interacting with our guests the way their families usually do helps to reduce the stress and create a feeling of familiarity and normalcy. Yappy Hour activities include TV time with animal-themed movies, relaxing on the porch, doggy dance time, visiting with different Care Providers, leisurely walks by the pond and, of course, extra special treats! While less active than a play session, each Yappy Hour is jam-packed with fun and helps your pet become familiar with our staff. Many of our guests look forward to their daily Yappy Hour time and greatly enjoy the various activities we offer. This service is great for first-time boarders, nervous pets, or any guest who would like some extra special attention. When the season is changing there is no better way to enjoy Autumn in the valley than by relaxing outside! Our guests take a leisurely walk to our secluded picnic spot, and once they arrive, we’ll spread out the picnic blanket so they can relax while snacking on tasty treats! Similar to our Daily Brushing service, brushing with a Furnimator is a great way to keep your pet well groomed during their stay. Brushing with the Furminator helps to remove loose fur and is ideal for pets that are shedding. Exercise is important for your pet so we offer daily interactive play sessions to all of our furry guests. Guests can have one-on-one time with a Care Provider and a toy in one of our large outdoor play yards. If your pet likes to play fetch, keep away or just have fun running around outside then they would greatly enjoy a daily play session while staying with us. We have a variety of toys to play with or your pet can bring their own! 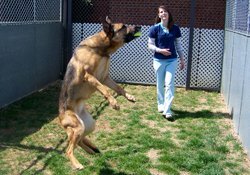 Play sessions are a great way to keep your pet happy and active! If your pet is always click-click-clicking when they walk, let us give them a pedicure! We can trim the nails on all four paws including dewclaws. Keeping your pet’s nails trimmed will help prevent painful breakages and make walking easier (and quieter). During the warm summer months, our guests are invited to take advantage of our Water Play sessions. Guests can play with our friendly staff with a waterproof toy in our swimming pool and participate in water-related activities to help cool off on hot days. Treat your pet to the full spa experience with a daily Bedtime Massage. Guests can get a full body massage from one of our team members before bed. A massage will help them relax and easily drift off to sleep so they can be ready to play in the morning. A Bedtime Massage is perfect for guests who love to be petted or handled and like lots of attention. If your pet is celebrating a birthday, why not have our team throw them a huge Birthday Bash? Complete with dog-friendly cake, party hats, decorations, friends, and treats, each Birthday Bash is a party your pet will love! We will also provide a framed photo of the festivities for you to take home and enjoy. Choose from our following service bundles to give your pet several extra comforts to relax and pamper them while you’re away! Does your pet love to go on outdoor adventures? Is he or she always ready to play or sniff out some fun activities? If so then your pet would love our Canine Caper interactive services! The Canine Caper includes a daily Extra Walk around our grounds, a daily private Play Session with a toy of your pet’s choice, and a daily Yappy Hour for some extra special attention. If your pet loves being active and meeting new people then the Canine Caper is the perfect mix of interactive services to give them a fun-filled stay. Make your pets stay heavenly with our indulgent Cloud 9 package. Perfect for guests who just want to be pampered the Cloud 9 includes a midday Extra Walk, a leisurely Evening Stroll, a relaxing Bedtime Massage and our premium plush bedding. Your pet will truly feel like they are on Cloud 9 with this divine services package. Does your pet enjoy getting the VIP treatment? Why not turn their stay into a full Health Spa Getaway? Complete with a calming Herbal Bath, a four paw Pedicure, a daily full body Brush and a relaxing Bedtime Massage this package is the perfect mix of pampering and fun for your pet’s canine vacation! Puppies of all ages enjoy this services package! The Yuppy Puppy includes two daily Extra Walks around our grounds, a daily one-on-one Play Session with a staff member and a toy of your pet’s choice and our premium puppy meal plan! If your young pup (or older pup who’s young at heart) loves romping around outside and has lots of energy to burn then we would highly recommend the Yuppy Puppy services package for their next stay! A package designed for families with multiple pets vacationing at the Country Club. Each pet participating may choose two of his or her favorite interactive services (one from each tier). Does your pet love to primp and preen? Do they enjoy strutting their stuff for adoring onlookers? Do they know how to strike a pose and smile for the camera? If so then our Pretty Pooch/Handsome Hound package has everything they need to get the star treatment they deserve. Each Pretty Pooch or Handsome Hound will get a relaxing Scented Moisturizing Bath, a four paw Pedicure, a daily full body Brush and their very own photo session! When you come to pick them up, we’ll give you a framed photo as a memento. Maybe your pet will be nice enough to autograph it for you when you get home (because they like to remember the little people who made it all possible). The following is a list of answers to our most Frequently Asked Questions. If you have a question that is not answered here please contact us. Q: How soon should I book my pet's reservation? A: We recommend booking your pet’s reservation as soon as you know your travel plans. We do fill up quickly during certain times of the year so you want to reserve space as soon as possible. This way you can ensure that your pet has a place to stay in the room of their choice. Call us at 540-943-7577 or request a reservation online. Q: I would a reservation for my pet, but you're booked. Do you have a waiting list? A: Yes! Often times we do have guests make last minute cancellations. We can add your pet to our waiting list for whichever type of accommodation they prefer and we will call you if space becomes available. Q: Which vaccines do you require? A: All of our boarding requirements, including vaccine requirements, can be found under Dog Boarding Requirements at the top of the page. Q: When can I drop off/pick up my pet? A: Feel free to check-in, or out, during our select Boarding Drop-off, Pickup hours. To see drop-off/pick-up times, please visit our contact page. Q: Can I bring my pet's own food/bedding? A: While we do provide food and bedding during your pet’s stay you are more than welcome to bring his/her own food, bedding and toys. We will ensure that your pet keeps his/her belongings throughout their stay and we will do all that we can to follow your specified feeding regimen. We do ask that you please keep in mind the space limitations of your pet’s accommodations when choosing which bedding and toys to bring. We want them to be as comfortable as possible during their stay! Q: Why do you require the Canine Influenza vaccine? A: We require the Canine Influenza vaccine for your dog’s protection. Just like human flu, Canine Influenza is highly contagious and can be deadly. We have guests from all over the country stay in our facility and not all dogs infected with Canine Influenza show symptoms. You can learn more about Canine Influenza and the importance of having your dog vaccinated at https://www.dogflu.com/. Q: How often will my dog get to go outside? A: All of the our guests are walked twice daily by our Care Providers and Dog Walkers (excluding Senior guests who get unlimited walks). You can add extra walks as an a-la-carte service or as part of an interactive activity package. Q: Can I see where my dog will be staying? A: Sure! Stop by any time during our boarding business hours for a guided tour or check out the gallery on this page. We ask that you tour our location prior to your pet’s stay. If your pet is already settled in when you take the tour, they may become anxious when they see you leave. Q: What happens if my pet has a medical emergency while I'm away? A: If your pet requires medical attention in a non-life threatening situation, we will contact you for instructions on how you would like us to proceed. We can have our doctors and nursing staff treat your pet here, transport them to their primary care veterinarian for treatment or (depending on the situation) wait for your return. If your pet requires medical attention in a life threatening situation, our doctors and nursing staff will treat your pet and will contact you to alert you to the situation. Once your pet is in a stable condition, we will follow your instructions for how you would like us to proceed. Q: My pet is on medication. Can you administer it during his/her stay? A: Yes. We can have our Licensed Veterinary Technicians administer any medication your pet requires during his/her stay. Q: Can you update my pet's wellness procedures and vaccinations during their stay? A: Of course! Any clinic procedures, including wellness and surgical procedures, can be scheduled during your pet’s stay. Q: My pet has special needs. Can you take care of these during his/her stay? A: We can take care of a variety of special needs including pets with trouble seeing/hearing, insulin injections or bone/joint problems requiring the use of ramps. If, however, your pet requires more intensive care (for example: cannot walk on his/her own), we would recommend “hospitalized” boarding to ensure that your pet gets the proper care they need.